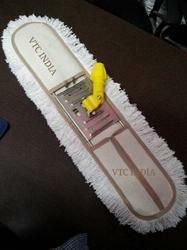 We are manufacture of dust control mop cotton and acrylic standard size availble. We are occupied with offering predominant quality Dust Control Mop. The mops offered by us are sourced from the genuine sellers of the business sector, who hold endless involvement in this space. They make whole range utilizing unrivaled quality crude material and propelled machines in the assembling procedure. Customers can profit these mops in various details according to their necessities. We are offering a superior quality range of Dust Control Mop - Acrylics. These mops can be availed at industrial leading price. we procure these Dust Mop from renowned vendors of the market. These products are thoroughly inspected by our quality auditors before being delivered to the customers. We are leading manufacture of dust control mop cotton. size: 46cm and 60cm.